Go into Rosa's shop and talk to her. Then go through the door to the back and talk to Napoleon Bandeto, (the only guy in that particular room). He will tell you that Monk was asking to see you. Go up the stairs and talk to Monk, Paulie, and Sonny. Sonny will be in a separate room. 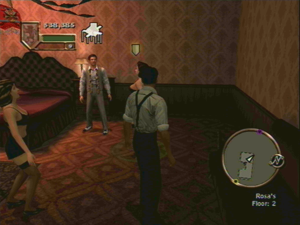 Then go back into the main room and wait for the cutscene. Then go back downstairs and bribe the cop to let you out. Go outside and go to the alley to the left. 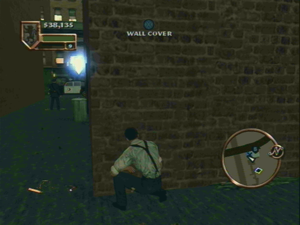 You'll have to sneak through the alley and kill each of the cops quietly. 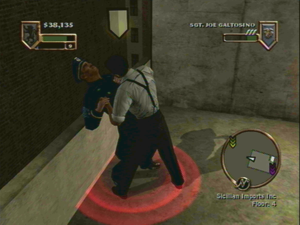 Crouch down, sneak up to the first cop, and strangle him. He'll drop a garrote wire that you can use on the next two. Take out the wire then sneak forward. Take cover whenever you get the chance. When you are sure the coast is clear, move on to the next hiding spot. Do this until you see the next cop. When you get the chance, sneak up behind him and strangle him with the garrote wire. You don't have to be directly behind your victim to use it, you can be a couple steps away. But you must be behind him for it to work, so if you're spotted, put away the wire so you can grab and strangle him with your hands. Now there will be just one cop left, at the end of the alley. Hide behind the last set of walls before you reach him. Wait there for a bit. He will eventually turn and walk over to the door to the right. Now sneak up behind him and strangle him. Take out a firearm and go through the door. Go down the hall and through that door. There won't be anywhere for you to take cover, so you'll have to come out firing. 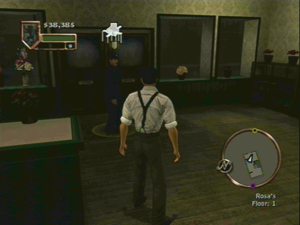 There will be two cops right in front of you, and a third across the room behind the boxes. After giving them early retirement, go up the stairs. 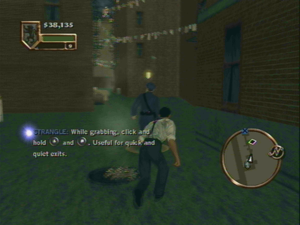 You will see Rosa and Sergaent Galtosino running away. Talk to Rosa, then go after Galtosino. If you have dynamite, blow the safe on Rosa's level. Go through the door, to the left, and then into the elevator on the left. Go out onto the roof and shoot Galtosino in the knee to demobilize for a bit. 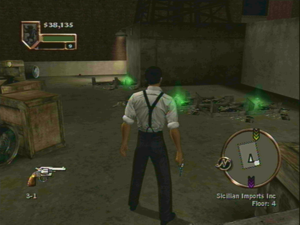 Then break all the crates to reveal four hidden bonus moneybags! Make sure you don't miss the one in the crate near the elevator. Now, go to Galtosino and start getting some revenge on him with your fists. Weaken him until his health is low, but be careful not to kill him yet. This will make him easier to grab and drag. Grab onto him and if he is on his knees, press to stand him on his feet. Now use to drag him to the ledge, and, if necessary, to get his back to the ledge. Press to hold him over the ledge and then press it again to throw him over. After the cutscene, the mission will be complete. Go back down the elevator and talk to Rosa. She'll tell you to go back to the compound and act as if nothing has happened. Do just that and head to the front door where the blue marker is. 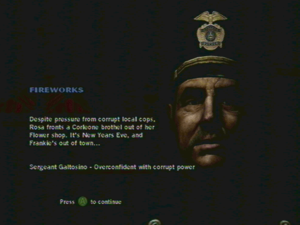 Talk to Clemenza and he'll give you some advice about bribing cops. Go inside and walk into the blue circle. There will be a cutscene in which you are promoted to Associate. You get a +10,000 respect bonus and $7,500 dollars. Go back out the front door and talk to the guy in the black jacket. He will tell you to meet Clemenza at his house in Brooklyn. Next, talk to Jaggy and he'll tell you about taking down warehouses. Now go to Clemenza's house. This will start the next mission. Special note: On the Wii, if he is on his knees, flick with + while holding and . Use to move him over to the ledge. Hold to move him close to the ledge then flick the + to throw him over. It should show on display as you push him near the ledge. If you unlock the neck snap, you can also garrote his police crew, just to save time. This page was last edited on 24 July 2011, at 12:33.